Hearthstone Grandmasters kicks off in May | PowerUp! Last month, Blizzard unveiled the Hearthstone Masters program. Designed to reform and change the way Hearthstone esports works, Blizzard revealed how two of the three elements of the Hearthstone Masters worked. Now, it has divulged the details of the Hearthstone Grandmasters; the pinnacle of Hearthstone esports. The Masters Qualifiers are currently ongoing and will send about 250 players to the Masters in Las Vegas in June. Hearthstone Grandmasters is split into three regions; Americas, Europe and Asia-Pacific. In each region, 16-players, for a grand total of 48, will be split into two random divisions. The eight players in each division will play a double round robin, with best of three Specialist format. Players are ranked in their division based on the number of wins and these divisions will be announced at the HCT World Championship in Taipei in April. Those who take part in the Grandmasters will earn performance-based prize money and are automatically qualified for all Masters Tour events. The top three players in each division at the end of each season will play in a six-player Grandmasters Seasonal Playoff. The finalist from each region for both 2019 seasons, plus two players from the China Gold Series—a total of eight players—will compete in the Hearthstone Global Finals at the end of the year for a $500,000 USD prize pool. 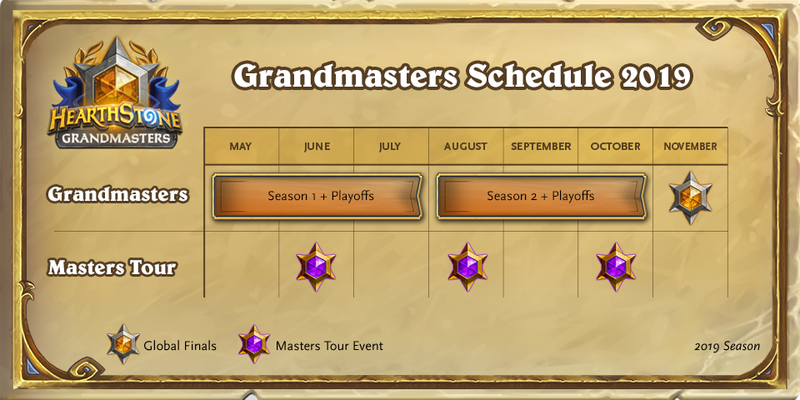 Two seasons of Grandmasters will be played in 2019. Each season will include eight weeks of online matches broadcast on Twitch. Fans will be able to watch five matches each Friday, Saturday and Sunday for a total of 15 each weekend. Hearthstone Grandmasters kicks off with season 1 on May 17. Check out the HCT 2019 World Championship page for more details on when your favourite players will be competing.